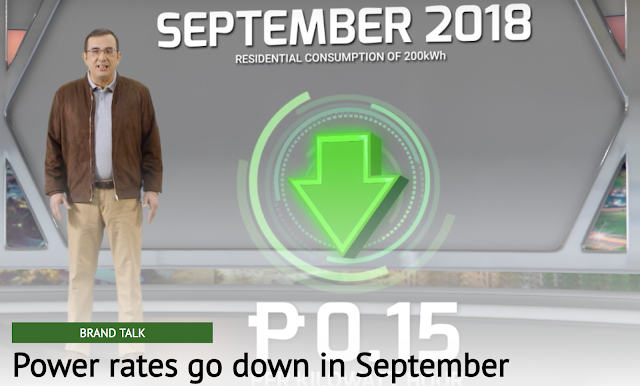 Despite the rising inflation and peso depreciation, the Manila Electric Company (Meralco) says there is a P0.15 per kWh decrease in overall electricity rates in September. “Meralco customers can find some relief in the decrease of power rates this month, as this goes against the current trend that we see with other basic goods and commodities,” said Meralco spokesperson and Public Information Office head Joe Zaldarriaga. The rate drop means a typical household consuming 200kWh will see P29 off its total bill. The price cut is mainly due to the lower Wholesale Electricity Spot Market charges, which was driven by the less power plant capacity on outage and lower average demand for power in Luzon. The transmission charge of residential customers also decreased by P0.0292 per kWh as a result of lower ancillary charges by the National Grid Corporation of the Philippines (NGCP). Taxes and other charges went down by PhP0.0394 per kWh this month as well. Meralco’s distribution, supply, and metering charges, however, have remained unchanged for 38 months, after registered reductions in July 2015. Meralco reiterates, it does not earn from the pass-through charges such as the generation and transmission charges. Payment for the generation charge goes to the power suppliers, while payment for the transmission charge goes to the NGCP. Taxes and other public policy charges like the FIT-All rate are remitted to the government. Meralco encourages its customers to continue practicing energy efficiency initiatives to help manage their electricity consumption. These include everyday household tips that may help save energy, such as: unplugging appliances when not in use to avoid “phantom load,” using the aircon at mid-setting or at 25 degrees Celsius for maximum efficiency, using a power board or strip which can supply power to several appliances at once and allows a user to conveniently turn them off simultaneously with just one switch, and maximizing natural light during daytime and keeping appliances well maintained to ensure optimal performance.